Ah, so it seems that the mystery is still a mystery. If you look on the internet or in Christian bookstores you will find it. If you listen to preachers either in your home church or through online sermons you will hear it. But it seems the one place we have forgotten to search for it is the only place it is actually found. What is it? It is the Mystery; more specifically the mystery of the Gospel. Paul spoke about it as though it had not only been revealed to him but as though he had also revealed it to the church. Yet, it seems we have either missed it or have buried it. Many who speak on the explanation of what this mystery is seem to have misunderstood its purpose and representation. This has in this writer’s opinion led to a plethora of wrong theology and structure within the body of Christ. Before I get into what I believe is the explanation of the mystery I want to give an examples of this error that best exemplifies the common misunderstanding. The example below is from a well-known Biblical scholar of today and this example shows a common view held among today’s Christian scholars on the subject of the mystery of the Gospel. But here is where we get into trouble. When we start inferring what Christ meant in what He said. The above statement is true to be sure. Marriage is a picture of Christ and the church but the inference we draw is where things get just fuzzy enough that it causes us to err. Let’s read the example further. Sounds harmless at first and even possibly Biblical but is it right? Sure we are to model Christ’s behavior. That is a true statement. Yes, husbands and wives are to live in relationship with each other that will properly show the relationship between Christ and the church. Once again I have no problem with this part of the statement. The part that gets us into trouble is the part that tells us we have inferred that there are distinctive roles for the husband and wife in marriage but the explanations we teach of those roles and the picture that marriage is to provide of Christs relationship to the church are not rooted in scripture as explained by scripture but rather scripture as explained by inference. Let me stop here and say that I by no means have a complete understanding of this topic but I understand enough to know that we have somewhere missed the mark on this topic and are giving a wrong picture of Christ and the church to the world. The picture we give through our teaching is that the husband takes on the pictorial role of Christ and the wife takes on the pictorial role of the sinner in need of redemption. We draw this conclusion from the passage in Ephesians 5. Later in this same passage Paul is very clear what the mystery is. In his letter to the Colossians Paul is equally as clear as to the nature and understanding of the mystery. Now normally in my writing I give scripture references but do not necessarily post the scripture text. This is because I want you to look for yourselves and discover but today I want us all to look at the scripture together to see what I am writing about. We will begin in Ephesians and then look at Colossians. What we learn from these passages is that Paul is instructing the church that the mystery is indeed the relationship between Christ and the church but the point is the unifying of two people into one body in relationship with Christ through the sacrifice of his blood. The mystery is not that Christ is in authority over all the church. This is a misleading statement as if Christ had to accomplish what he did in order to gain authority. First, the purpose of Christ’s redemptive work was to restore creation to its rightful place and relationship to its Creator and itself. Christ’s authority was never in jeopardy due to the fall of man. Christ’s authority was never in question due to the fall of man. Christ’s authority need not be restored for it was never lost or marred. Christ is in authority over all of creation not just the church. He has a relationship with all things not just the church. All of creation is involved. Some live in a restored relationship of unity with their creator and their fellow man while others still live in separation. This is the picture of Christ and the church not that the marriage portrays the distinctive roles for husbands and wives but that the restoration of relationships occurs in Christ; two people, the Jews and the Gentiles; husband and wife become one flesh, people, body. If subordination and hierarchy are to be portrayed in the marriage relationship by husband and wife with husband as Christ and wife as the church and this example is the picture of the joining of the Jews and Gentiles into one body then the question must be asked are the Jews in authority over the Gentiles? Are Gentiles to submit to Jews in the church? If so, then how? How do we see this put into motion today? It is my understanding that Christ didn’t die to set up earthly roles for human beings. He died to restore and to unify. When we interpret the mystery this traditional way as seen in the example first given at the beginning of this blog post it gives the implication that only one person in the marriage is to mirror the example of Christ in the world while the other portrays the example of fallen man in the world restored by Christ. Yet we know that all believers are to be the example of Christ in the world. Men see themselves as Redeemers while women view themselves in need of redemption by man whether consciously or subconsciously. This particular interpretation of the mystery also sets man up as master to be obeyed and followed and woman is set up to do the obeying and following. Many claim as by their natural state. It is my argument that the picture the mystery is to portray through the marriage relationship is that of two people being united in Christ. The Jews and the Gentiles were united in Christ into one people; one body but notice also that men and women were united, slave and free, circumcised and uncircumcised and even Barbarian and Scythian. Some argue that these passages refer only to the spiritual aspects of man through salvation and do not remove or deal with physical barriers. But I again must disagree. I disagree with this assessment of these verses because while it is through the sacrifice of Christ that all men are unified into one body and salvation is made available to all it is through the renewing of the mind as seen in Colossians 3:10-11 that these distinctions should disappear between us as human beings. It is through the renewing of the mind that we should see our relationships with Christ differently as well as our relationships with each other. There were tangible physical differences that took place for each of the groups mentioned in both the Galatians and Colossians passages. The veil was torn for all people. Technically, in light of Christ women, Greeks, barbarians, and slaves were allowed into the Holy of Holies not just the Jewish high priest. All were adopted as ‘sons’ by God. There are many more verses that use this same phrase “adoption as sons.” Many who try to minimize the gender influences in the Bible do a great disservice to those who seek to truly understand. They are also wiping away the very thing they are trying to prove. Many believe that these male and female pronouns are the result of cultural influence and as such need to be corrected for today’s understanding but this is a grievous error. The above two verses as well as all others that use this same phrase make the point not only of cultural influence but of God’s understanding and transcendence of this cultural influence for those who become His children. You see only sons could receive the inheritance in first century Middle Eastern culture. This is why these verses are so great. God adopts us all as sons so that we all receive the same inheritance through Christ. There are reasons which I will not go into in this post as to why the cultural influence is necessary as an integral part of the plan of Creation and how Christ’s sacrifice and subsequent victory place us all high above them. For now, I will leave it at we according to scripture are all “adopted as sons” and as adopted sons all share the same rights and responsibilities as sons of God. Please don’t get me wrong gender differences are important and should be respected, honored and celebrated but they should not be used as barriers or platforms. I encourage you all to do a scripture study of the “Mystery” for a fuller understanding of this topic. I also welcome discussion on this point as long as the sources of the conversation come from scripture first and inference/cultural influences second. As I stated previously, I have by no means come to a full understanding of this topic. What I think I begin to understand today may be changed by increased illumination into the things of God through His Holy Spirit that dwells in me but this one thing I do know. We have done a great disservice to the world’s understanding of the mystery when we make it about one role taking the position of Christ while the other takes the position of the repentant sinner. We are all sinners in need of Christ and as such none can serve in the position of Christ save Jesus Christ alone. If this is the picture to be portrayed then the hierarchy must remain intact thus making Greeks submissive to Jews in both the physical and the spiritual realm. The mystery is about the unifying of two people/groups which is only found in relationship with Christ. 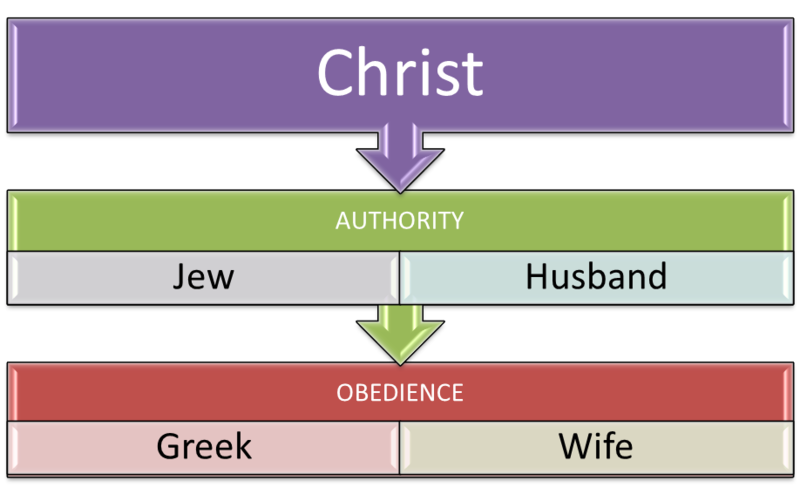 This is the relationship of two people operating in equality as one in the power and authority of Christ. In Christ we have restored relationships. The Jew and the Greek can enjoy unity and equality only when united in Christ. Man and woman can only represent the mystery when we understand that we both represent people who need Christ and only in relationship with Him can we be properly united into one body in equality with each other. New American Standard Bible: 1995 update. (1995). (Eph 3:8–11). La Habra, CA: The Lockman Foundation. New American Standard Bible: 1995 update. (1995). (Col 1:25–27). La Habra, CA: The Lockman Foundation. New American Standard Bible: 1995 update. (1995). (Col 2:2). La Habra, CA: The Lockman Foundation. New American Standard Bible: 1995 update. (1995). (Ga 3:26–29). La Habra, CA: The Lockman Foundation. New American Standard Bible: 1995 update. (1995). (Col 3:10–11). La Habra, CA: The Lockman Foundation. New American Standard Bible: 1995 update. (1995). (Eph 1:5). La Habra, CA: The Lockman Foundation. New American Standard Bible: 1995 update. (1995). (Ga 4:4–7). La Habra, CA: The Lockman Foundation.